I’m therefore looking for something that helps me keep my finger on the pulse a little more. Certainly monthly figures are desirable. I am going to therefore use housing data published by RPData and in particular I will monitor the Brisbane and Logan City numbers. The ABS published their quarterly data to December 2009 on Monday. This chance only comes every 3 months and so it is interesting to compare the ABS data with the alternate monthly dataset that I am using from RPData which is shown in the above chart. The ABS shows that for the quarter to December 2009 Brisbane prices have risen by 3.8% with a year on year increase of 10.9%. Remember the ABS reports median prices for detached properties only. In contrast from RPData I am using what are called recent median house sale prices so I would expect similar data. For Brisbane the data shows increases for the quarter to December 2009 of 5.9% which is significantly different to the ABS. Year on year the increase is 7.1% which is also significantly different to the ABS. If anybody can explain the big difference I would be very interested to know. 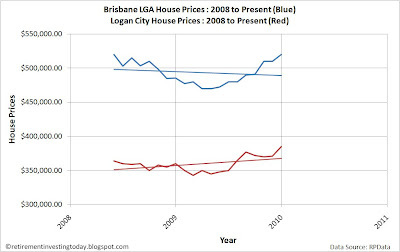 Also looking at Logan City the quarter reveals increases of 3.5% while year on year increases have been 7%.